Hon’able Chief Justice of Pakistan, having exercised powers in terms of Finance Division’s (Expenditure Wing) O.M. No. 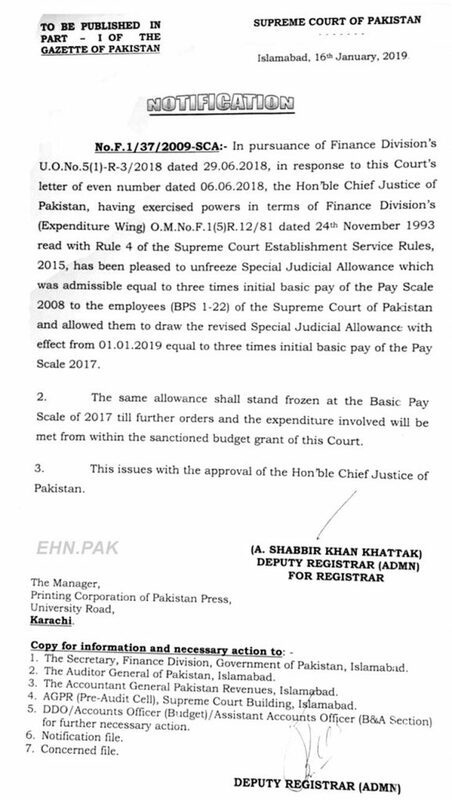 F.1(5)R.12/81 dated 24-11-1993 read with Rule 4 of the Supreme Court Establishment Service Rules, 2015 has been pleased to unfreeze “Special Judicial Allowance” which was admissible equal to three times initial basic pay of the Pay Scale 2008 to the Employees (BPS 1-22) of the Supreme court of Pakistan and allowed them to draw the revised Special Judicial Allowance with effect from 01-01-2019 equal to three times initial basic pay of the Pay Scale 2017.